The Olympic delay is finally over, now I'm back full in anime mode. 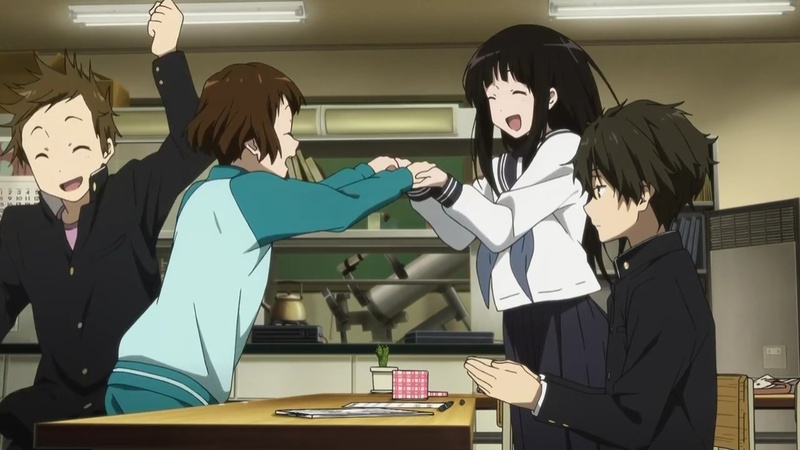 Hyouka is among the first couple on my list. Having seen a recent surge of the detective animes, it's hard to image there'll be another anime that could beat GOSICK or Kamisama no Memochou or UN-GO from last year. But Hyouka has proven me wrong. The biggest difference between Hyouka and conventional detective anime, is that conventional detective anime, including those mentioned above, usually either extremely dark and heavy, or just out right silly (like Lupin the Third). It's hard to actually find a detective series that is outside those two extremes because by nature detective animes are dark and twisted, and usually brutal silliness is the only thing that can pull it out of that. Hyouka on the other hand, struck nearly perfect balance to not let the series fall too dark, yet be able to maintain a suppressed feel when it needs to be. This so far has been an exceptional series. If you are not watching it, I would highly recommend to start watching. looks good to watch.. angd has good graphics too..